Third party companies, get on it! It honestly isn't that unique. The transformation is simple, if not unbelievable, and the head is simply Fortress Maximus' G1 head. Hardly original. Looks like a Legends class figure. I need a toy of that now. 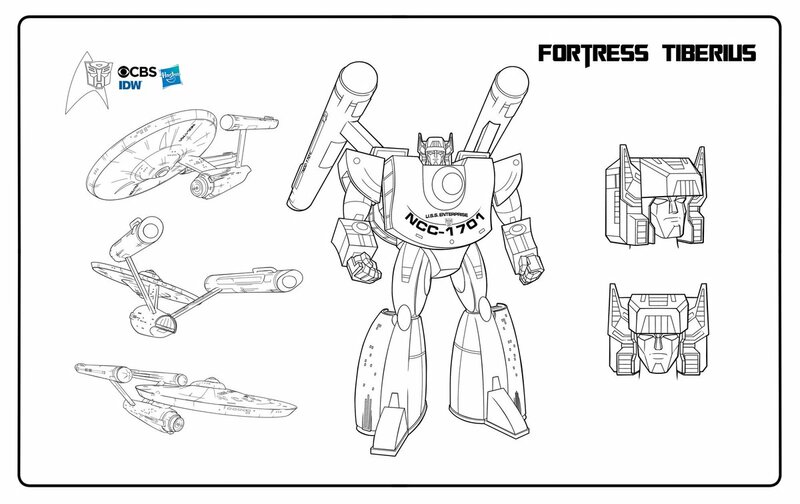 Gee, that must be why... it's Fortress Maximus. I mean, come on. The name should've given that away. I don't the enterprise has enough mass to make that possible... or maybe it would be a very very hollow toy. Maybe some of the later TNG ships could work, with their lower profile you could pack more parts into the frame. Very cool idea though just not really sure its possible to make work anywhere but on paper, hope I am wrong though. I showed it to my wife, the rabid Star Trek fan. She gasped and gazed and said "If they make that, I don't care how much it costs, you're buying it!" Man, I can't see how this will transform. I highly doubt it can function as a real 3d toy. There have been several kitbashed attempts at an Enterprise Transformer. I think the best ones use Cosmos, since his saucer mode lends itself well to the shape, then has the rest of the ship as add on accessories/armor. Wow, that's a really fun idea and design! Despite being a Star Trek fan I kind of wrote this crossover off, but now I want to give it a look. I could see this having a similar charm to Scioli's Transformers vs GI Joe series. As a fan of Transformers and Star Trek, that is definitely fun to see. There's nowhere his arms can possibly go in alt mode (the warp nacelles should probably have turned into the arms) but that's okay! Can we get Trypticon as a Klingon Bird of Prey? Scorponok as a Romulan Warbird? Take my money, Hasbro! Rotate the waste 90 degrees, fold the legs to form the bottom/body of the ship, accordian out the torso to the front of the ship body. Remove the head. Fold the disc halves up, rotate, then arms make rest of the disc. Body connecter to disc is in the torso(hidden under the folds, so once you uncover the disc spot and then rotate, there's the body to disc connector), then lift the warp thrusters on folding plates to attach to the rear of the body covering up the leg seams in the process. Only problem would be some minor gaps in the disc where the arms collapse, but the right panel folding methods, and those can be hidden some. Rough estimate at least. Some other little engineering tricks needed too. Also skipped the step of folding the hands in, but fold those in, then use a plate that folds out from the back of the hand/forearm that has a fold plate on each side to further cover that hand hole gap when the hands are stored away. It's very possible. 3p would have room to do it with fold panels, but Hasbro (rights pending) could do it easily enough with the right short cut tricks to part storage, and spring loaded collapse spots. No parts forming needed. Though the headmaster part would need a basic Cerebros robot mode, would be extra cool if it could turn into a Shuttle craft for the Headmaster to cerebros to drive. Voyager would have worked better.